TMJ syndrome is broadly classified into 2 syndromes. The temporo- mandibular joint (TMJ) is the synovial joint that connects the jaw to the skull. These joints are located just in front of each ear. If you are interested in knowing a bit more about this syndrome, check out this link . • Jaw exercises to strengthen muscles and improve flexibility and range of motion. • Heat therapy to improve blood circulation in the jaw. • Ice therapy to reduce swelling and relieve pain. • Massage to relieve overall muscle tension. • Movement of the temporomandibular (TM) joint to release scar tissue that restricts muscle movement and to improve range of motion. • Ultrasound therapy- to reduce pain and swelling and improve circulation. If you have any further queries please call PhysioNow. Our experienced Registered Physiotherapists would be happy to help you recover from TMJ syndrome. There are Registered Physiotherapists at each of our locations that are trained specifically to assess and treat this injury. Assessment takes about 40-50 minutes and each treatment typically takes about 30-40 mins. 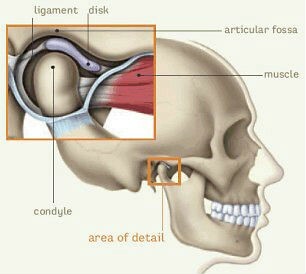 Resolution of TMJ syndrome can be quite rapid with some patients only requiring a few visits for the pain the stop.